I've told you about J & J Snack Foods before. They own Super Pretzel (e.g. the soft pretzels you have from nearly every concession stand/fair/etc) and Tio Pepe's Churros (e.g. the churros you see on the boardwalk). They also own "The Funnel Cake Factory". The Funnel Cake Factory makes frozen pre-formed funnel cakes, mixes to fry your own, and, frozen funnel cake fries. I'll admit I was pretty skeptical about these, since, well, funnel cake is one of those things that is great when you have it absolutely fresh. I didn't think they would be remotely good when frozen and re-heated in an oven (or fryer). And ... I was basically right. 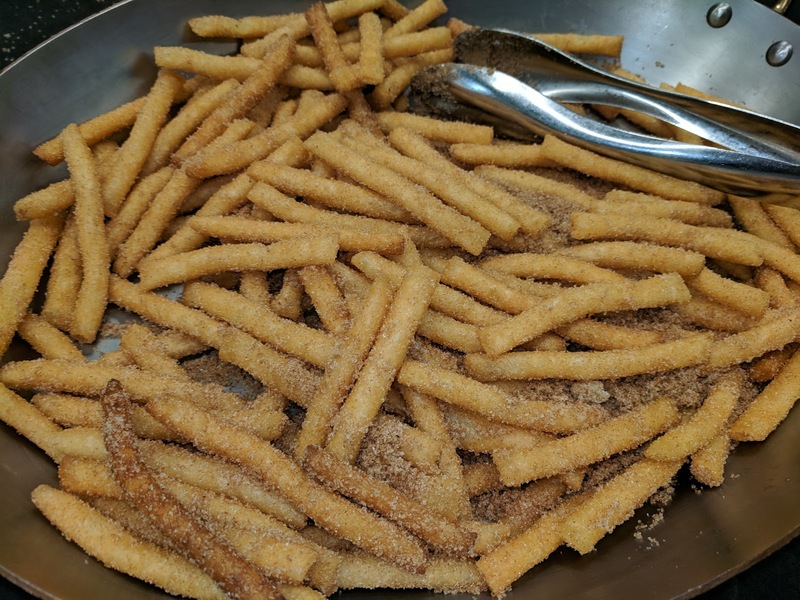 "The Funnel Cake Factory funnel fries offers a twist on the traditional french fry and is a great dessert! Shake them up tableside with some powered sugar." The fries were ... kinda boring, to be honest. The ones I had were baked and tossed in cinnamon sugar. They were soft, but weren't really doughy, or oily, in the way a good funnel cake is. They were just some warm crispy things, with lots of cinnamon and sugar on them. Exciting in concept, but, not actually very interesting. 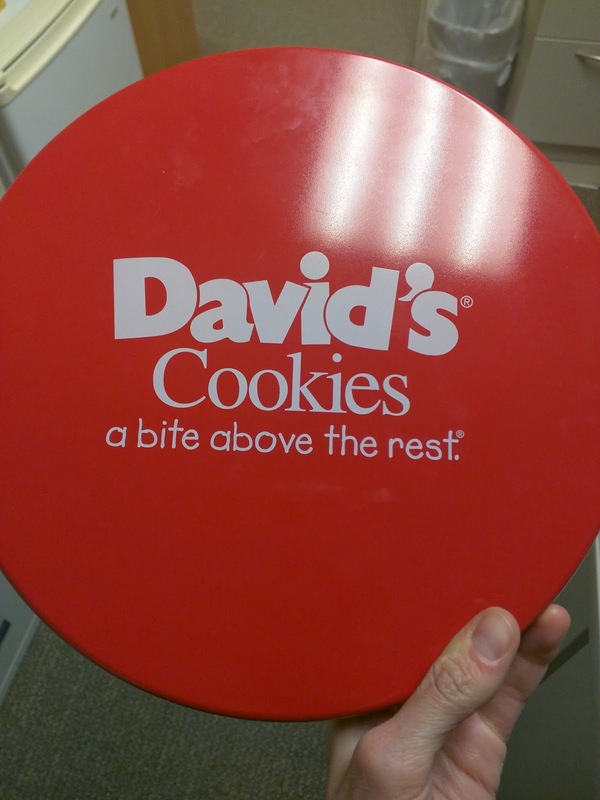 I've reviewed David's Cookies before, when my mom received a mail order assortment of cookies and brownies, and I was quasi-impressed with the quality. This time, I've had the opportunity to try several of the baked goods, available to foodservice vendors. And they are good. I was even more surprised. "Butter and cream ensure a rich flavor and tender texture. 100% trans fat free. Sweet and savory varieties. Two formats available." David's Cookies makes scones of several varieties (cinnamon chip, chocolate chip, raisin, cranberry orange, blueberry, butterscotch pecan, savory cheddar chive) in multiple frozen formats for food service distribution: thaw & serve, or individually frozen and ready-to-bake. My office occasionally offers the later for morning catering events, when they aren't able to bake fresh made items in-house. The scones are a particular style. They are not the hard, crumbly style I tend to think of as "scones". Rather, they are soft and cakey, more like shortcake or biscuits. They are also very large, monster sized triangles, bigger than I really want as part of a balanced breakfast. They remind me a bit of Panera scones. "The richness of a scone. The flakiness of a biscuit. The deliciousness of David's. It's all combined into one scrumptious biscone." Amusingly, when I was trying to find out more about these, I saw one site labelled them "Biscones". I first thought it was a type-o, but I realize what they were getting at. Biscones = biscuit + scones. Cute. And more fitting. "Incredible, delicious combination of blueberries, heavy cream, butter and sugar." I liked these scones. 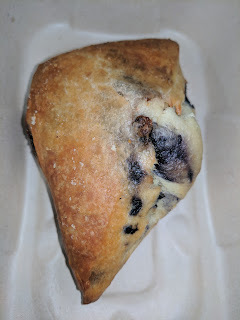 While I generally go for the more crumbly style of scones in the morning, I liked the tang to them, and the plentiful large blueberries inside. It was also larger than I wanted, although I just saved some to have later in the day with whipped cream on top, and called it dessert. So while too big, and not the style I prefer for breakfast, I think these are good, and, in particular, with some whipped cream, they make an excellent dessert, more like a shortcake. 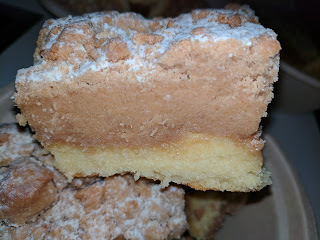 "A true crumb cake, rich and buttery, with a 50:50 ratio of crumb topping to cake. Fully baked, pre-portioned, 100% trans fat free. 48/6 oz portions per case. Simply thaw and serve." David's makes crumb cakes in 4 flavors: original butter, raspberry, chocolate swirl, and caramel apple. You can also purchase them fresh in regular sizes, but the ones I tried came through their foodservice distribution, a huge tray which arrived frozen, ready to serve upon thawing. "The American classic made with real butter cake base and cinnamon streusel topping dusted with powdered sugar." 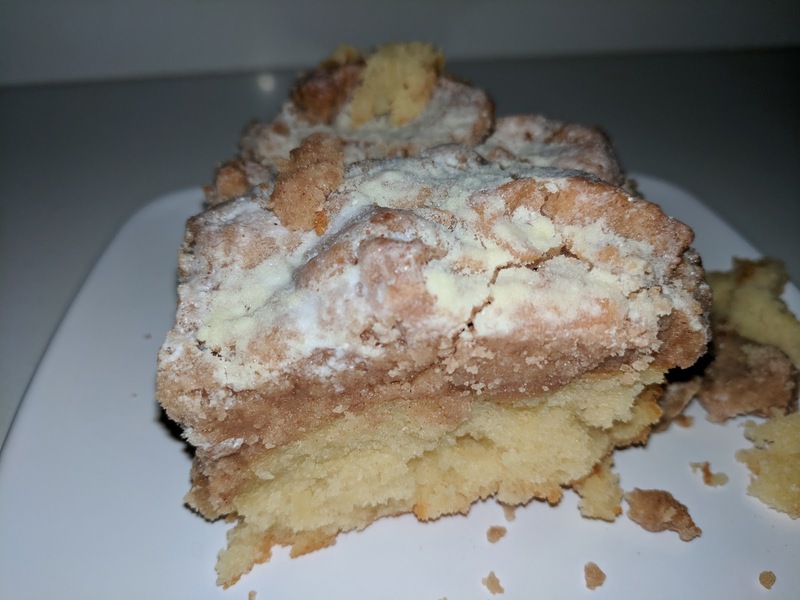 "Our Original Crumb Cake is the perfect addition to a brunch or other gathering. Made with fresh butter, brown sugar and cinnamon streusel topping and gently dusted with powdered sugar, this pairs well with morning coffee or as a light dessert!" "An American classic with a 60:40 ratio of cake to crumb topping. A dense & moist cake topped with a thick layer of scrumptious cinnamon streusel dusted with powdered sugar on top." The cake layer was moist, extremely buttery, and kinda plain otherwise. 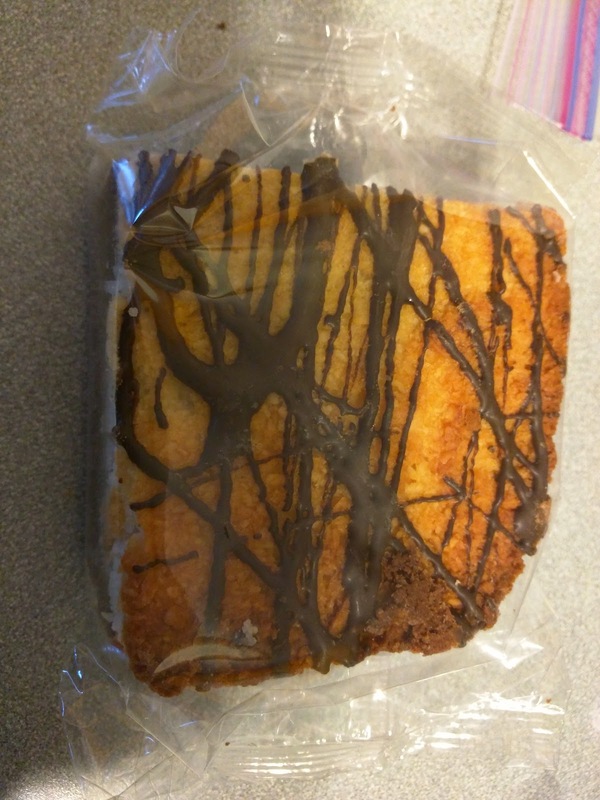 It did not eat like a breakfast item, as it was too sweet, and too buttery, more like a rich pound cake. The topping was delicious. A very thick layer, as promised. This first slice I had was more like 30/70, but I found later slices that were 70/30. Soooo much topping. Soft, sweet, cinnamony, buttery streusel. The topping was a serious winner. It was funny watching which slices different people went for. Some clearly wanted more cake, less topping, and me? I was all about the topping. I think this coffee cake would make an excellent trifle layered with cream. This is not a light item. 1/2 a piece has 430 calories, 29 grams of fat, and 29 grams of sugar. Yes, half a slice. It is made with palm oil, vegetable oil blend, corn syrup, sugar, brown sugar, invert sugar, etc, etc. You get the point. Not a wholesome item. But delicious. 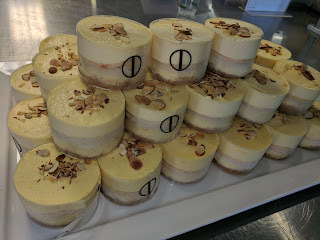 "Offering a wide selection of single serve cakes, cheesecakes and mousse desserts, these miniature masterpieces have flavor combinations such as raspberry with lemon, pineapple with coconut, and elegant dark chocolate mousse with edible gold pieces. Appealing to all types of foodservice segments, these pre-portioned desserts can shine in high-end establishments, catering services or small boutique stores. Every individual dessert is hand decorated and one of a kind!" David's also sells some individual desserts to food service distributors, marketed as "Annie's Euro American Bakery", a variety of individual little cakes. "Refreshing contrast of both mango and guava cheesecake. Topped with a light mango puree mousse. Finished with toasted almonds." The base was classic graham cracker crust. Decent texture, soft but firm, but it tasted like ... sawdust. Next up is the mango cheesecake, fruity, good consistency. Same with the guava cheesecake. Good consistency, although I cared less for the flavor. The "light mango puree mousse" layer I didn't like though. It tasted like seriously fake mango. And it was strange to have a fluffy layer on top like that. Speaking of on top, why the almonds? Overall, good texture to the cheesecake, but not flavors I really liked. It also was not light, but, what should you expect from cheesecake? 520 calories each! Just to mix it up a bit, I'm going to stretch my "bakery" review day theme a bit to include ... mail order baked goods. Hey, they still count as baked goods, and these are ones accessible to you anywhere in the US. Expanding my review horizons! David's is a large commercial "gourmet" baked goods manufacturer. Given the name, you can guess what the signature product is: cookies. They also make other baked goods such as brownies, scones, crumb cakes, and ruggalach. Plus layer cakes, cheesecakes, chocolate truffle cakes, a slew of French tarts, and, randomly, chocolate covered strawberries. I believe online is their largest market, although they seem to also have a large fundraising business, and have been around since 1979, so obviously their distribution channels have changed over time. Corporate gifts and gift baskets seem to be the target market. Cookie Brownie Party Tin, 5 lbs. $59.95. When I was visiting my family, my mother received a lovely gift of a huge 5 pound party tin full of cookies and brownies from David's Cookies. Ever curious, I had to try them. All of them. Even though you know I don't really like cookies. I'd say it was for the benefit of the blog, but really, who am I kidding? I can't resist trying a dessert, even if the chances of me liking it are low, as seemed the case with not even fresh cookies and brownies. Cookies are obviously David's specialty, specifically chocolate chip cookies, although they make about 20 varieties. Cookies come in tins, ranging from 1 to 5 pounds, or mixed with brownies or other items in gift baskets. You can also buy the chocolate chip in mini form, or as frozen dough to bake off yourself. Our tin had six varieties in it, and I obvious tried them all. Sadly, our tin contained just the basics, not any of the fun ones like Butterscotch Pecan, Coconut Pecan, Red Velvet, Mint Chip or Smores, that David's also makes. "They are made with cinnamon, thick molasses, sweet brown sugar, and vanilla for a taste that will bring you back to the good ol days." The oatmeal raisin was the first cookie I tried. 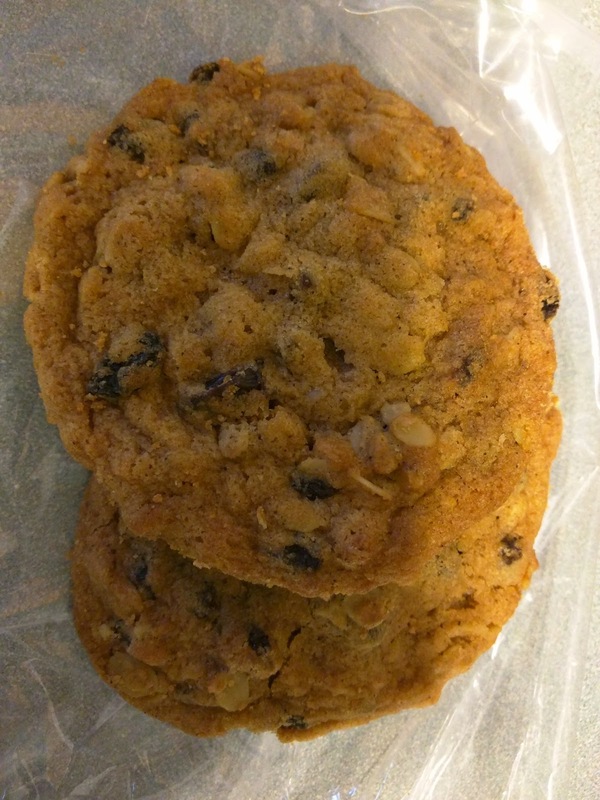 A fairly standard oatmeal raisin cookie. Decent heartiness from the oats. Good distribution of not-too-hard raisins. Soft enough style. A classic cookie, and Ojan liked it too. My second favorite of our batch. I am curious what was "old fashioned" about it though ... what do new age oatmeal raisin cookies look like? They also make a orange oatmeal cranberry, which sounds like a fun seasonal selection around the holidays. 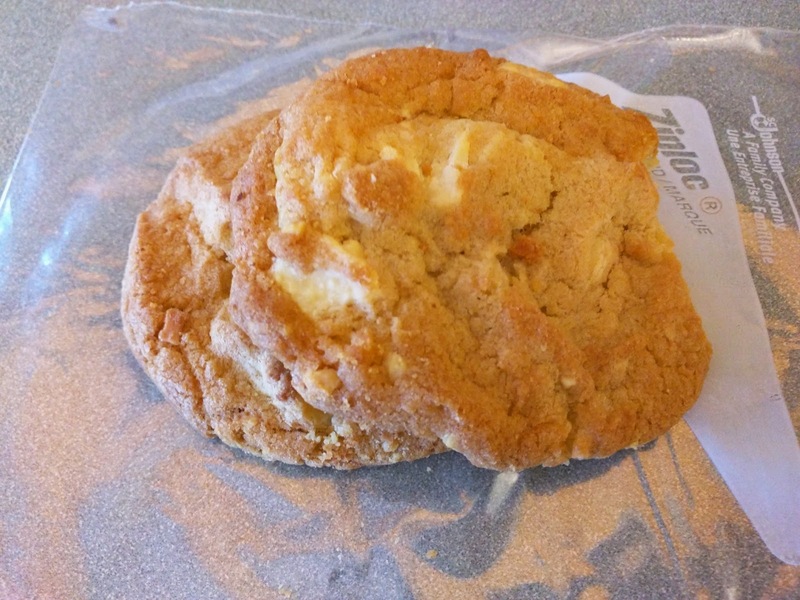 "What do you get when you combine delicious white chocolate with succulent macadamia nuts into one cookie?" Next I moved on to the macadamia white chunk. It was another softish cookie, although a bit overcooked and crispy. However, there was only one macadamia in the entire cookie. The distribution of raisins in the oatmeal raisin was totally acceptable, but this was not. There were also a few fairly boring white chocolate chunks. I did at least appreciate the use of chunks rather than chips, as they provided more sweetness. Overall, there was nothing interesting here, it was just inoffensive. My 4th pick overall. "Silky smooth butter, sweet sugar, creamy milk, and powdery flour are paired with the perfect balance of tart dried cherries and sweet white chocolate for the ideal cookie flavor." Next, cherry white chip. 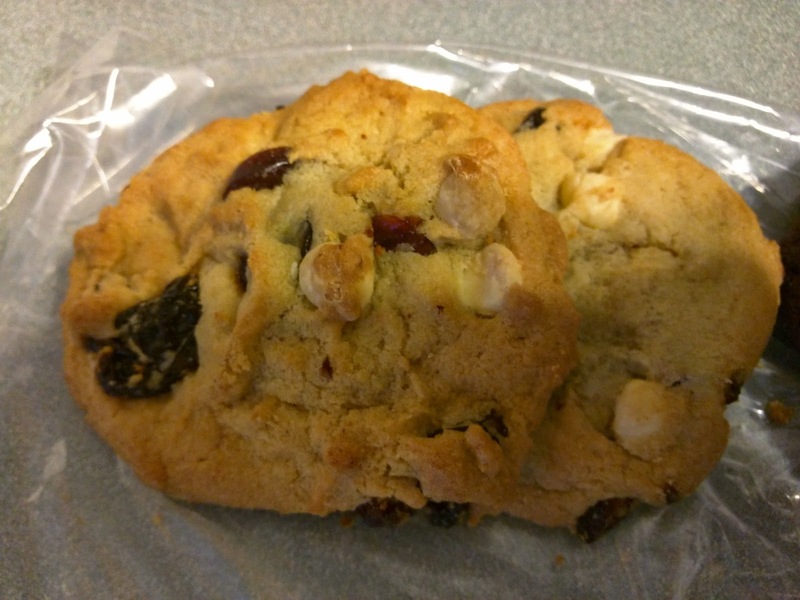 It was very similar to the macadamia white chip, just with dried cherries replacing the macadamias. It also was a bit overcooked and crispy. The base cookie was pretty boring. The white chocolate chips were generic. The cherries were large, but rock solid. My sister, Ojan, and I all did not care for this, and we ended up throwing out the extras. Our least favorite, by far. 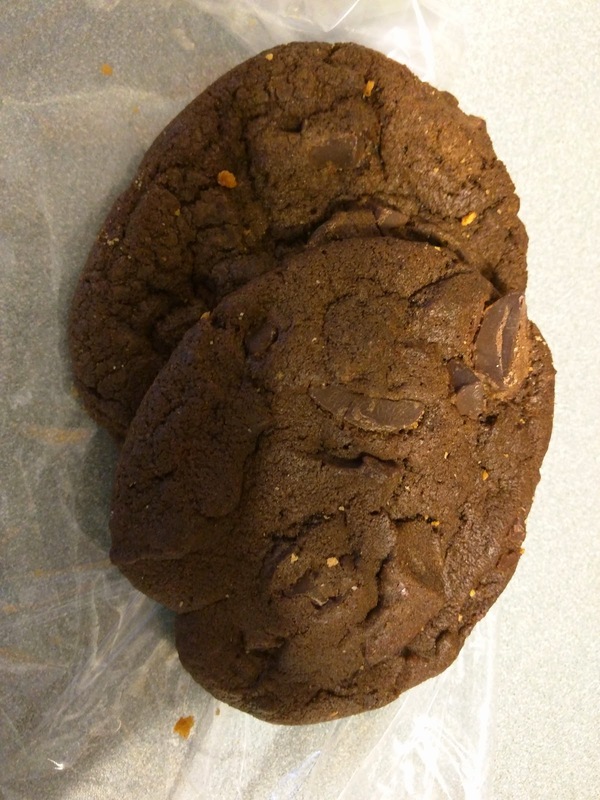 "David’s has perfected the art of the chocolate chip cookie by using only the best ingredients. Our recipe calls for fresh eggs, milk, velvety butter, and loads of big Hershey’s Chocolate chunks to create the most irresistible cookies on this planet. " Next, the one Ojan was most looking forward to: chocolate chunk. It had another slightly sweet standard cookie base. It was a nice soft style, not overcooked like the white chip varieties. Although I doubted them for using Hershey, since I don't exactly endorse the the quality of Hershey chocolate, the milk chocolate really wasn't bad. And chocolate chunks are obviously better than little chips. Like the oatmeal raisin, this was a pretty standard chocolate chunk cookie, no more, no less. My 3rd pick. "They have gigantic chunks of Hershey's chocolate mixed into smooth and sweet chocolate cookie dough. It's a soft chocolatey cookie stuffed with delicious chunks of milk chocolate." Like with the chocolate chunk, I appreciated the large chocolate chunks, and again I didn't actually mind the Hershey chocolate. 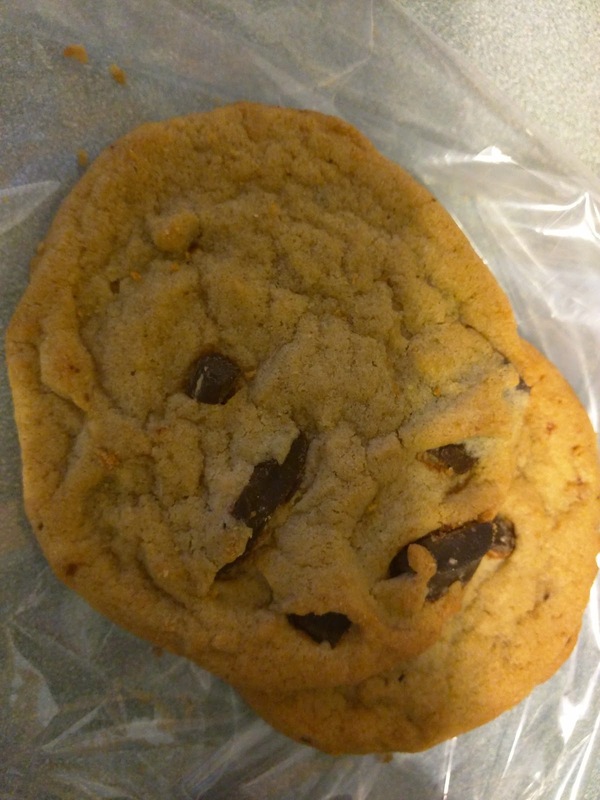 But the base cookie wasn't very chocolatey, so flavor-wise, it didn't offer much over the standard chocolate chip. This was Ojan's favorite flavor, since he does love chocolate the most, but my second to last pick. "Our original cookie dough made with fresh butter, sugar, flour, eggs, and milk is swirled with peanut butter and Peanut Butter Chips for one of our most divine cookies ever." This was, hands down, the winner of the bunch, and I didn't get a photo of it. The base was the winning component, full of peanut butter flavor. 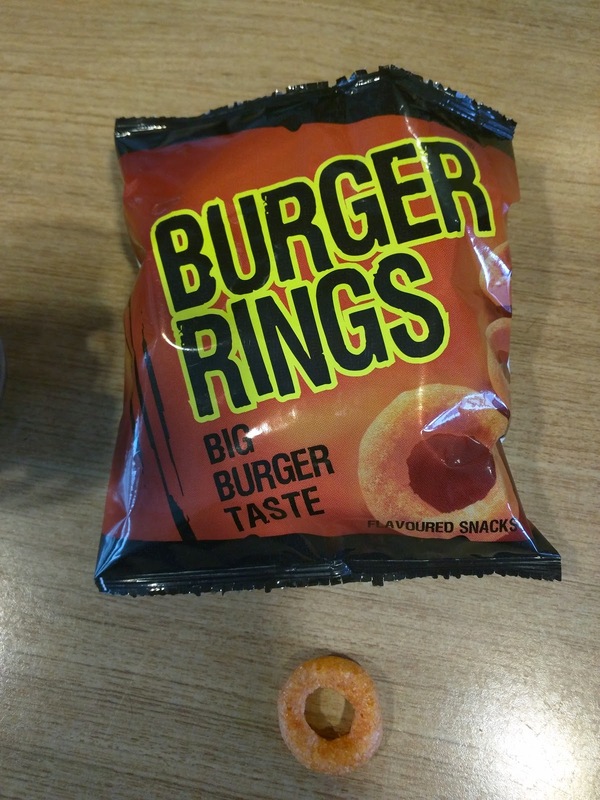 It was accented with further peanut butter in the chips throughout. The style was more like the macadamia and cherry cookies however, crispier than I would prefer. My favorite, but still, not something I needed more of. David's also makes 6 varieties of brownies: Chocolate Chip, Peanut Butter Swirl, Cheesecake, Pecan, Rocky Road, and Macaroon, plus a Blondie. Brownies are available alone, or mixed with cookies or crumbcakes in tins or boxes. The chocolate varieties all use a chocolate chip base, "made with pure melted chocolate and loaded with sweet chocolate chips", Hershey again. Each brownie is a large 4 ounce "slice". 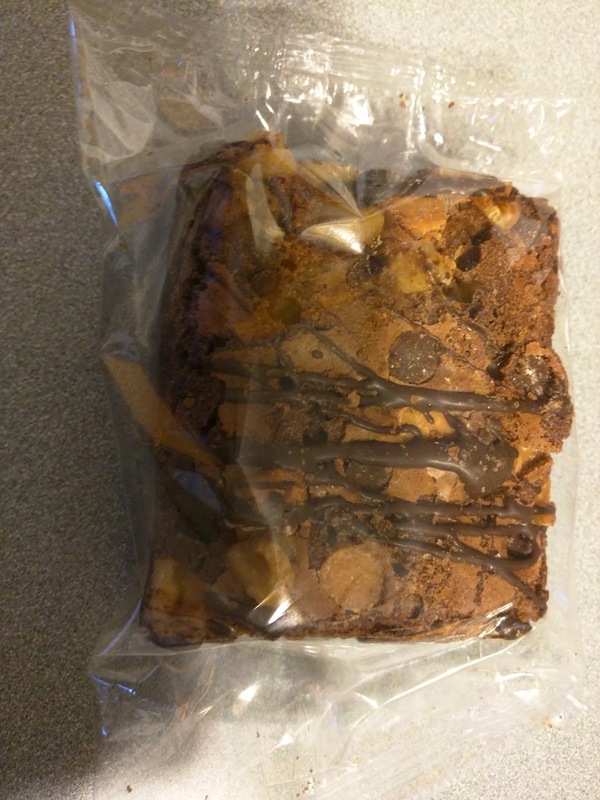 Unlike the cookies that were loose in the tin, the brownie slices were individually packaged. Our tin contained all 6 varieties of brownie, but no blondies. The peanut butter swirl and cheesecake were my first picks based on descriptions, but both looked rather dried out, so I skipped them. "A luscious blend of our fudgy chocolate chip brownie with gently toasted buttery pecans." The pecan brownie was indeed fudgy, fairly rich, and not dried out or stale, which surprised me a bit. I did enjoy the addition of the chips for an extra chocolate burst, and the nuts for crunch. 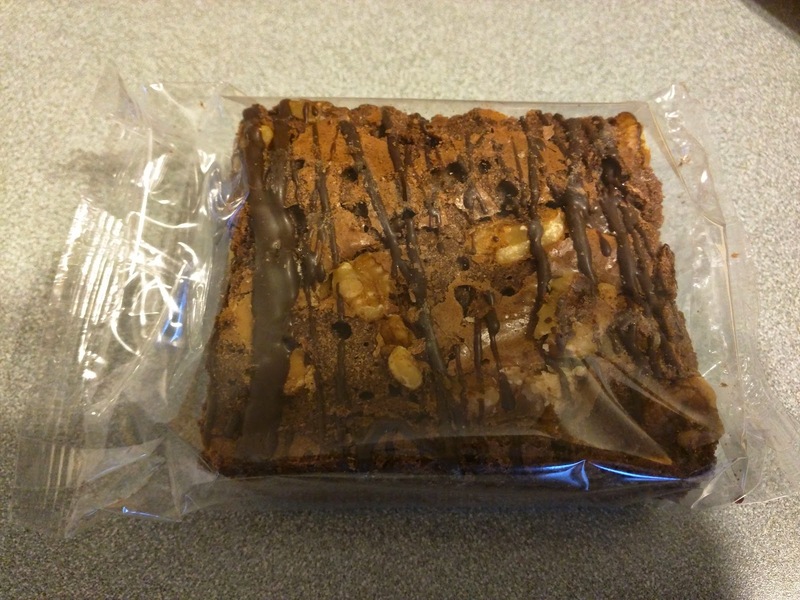 For a packaged brownie, it was not bad. "Indulgent black walnuts, rich peanut butter chips and a chocolate swirl on top make this brownie the one to cure any craving." Next, the fun sounding Rocky Road. There was a lot of goodness in this one. Again, a very rich, fudgy chocolate chip base. I liked the addition of the peanut butter chips and the nuts. A good mix of textures and flavors. Again, for a not fresh brownie, it was fairly tasty. "Our newest brownie starts with our classic brownie and covers it deep in toasted coconut with a drizzle of chocolate." This was a very dry brownie. The base brownie was mild chocolate, fairly dried out. It had a shredded coconut layer on top of that which was very dry. Artistically drizzled with chocolate which looked nice, but didn't really add much flavorwise. Definitely the losing brownie, way too dried out, and with no real flavor. 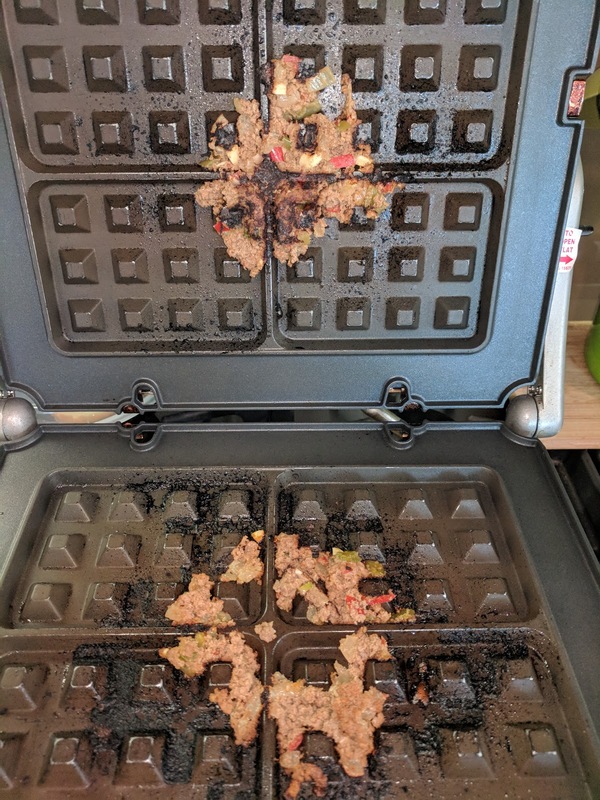 Today's waffling leftovers story is a kinda funny one. Not a success, but, still fun. (What am I talking about? 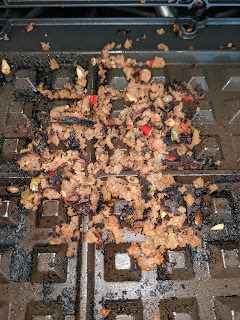 Go start with my master waffling leftovers post if this concept is new, and then return here). 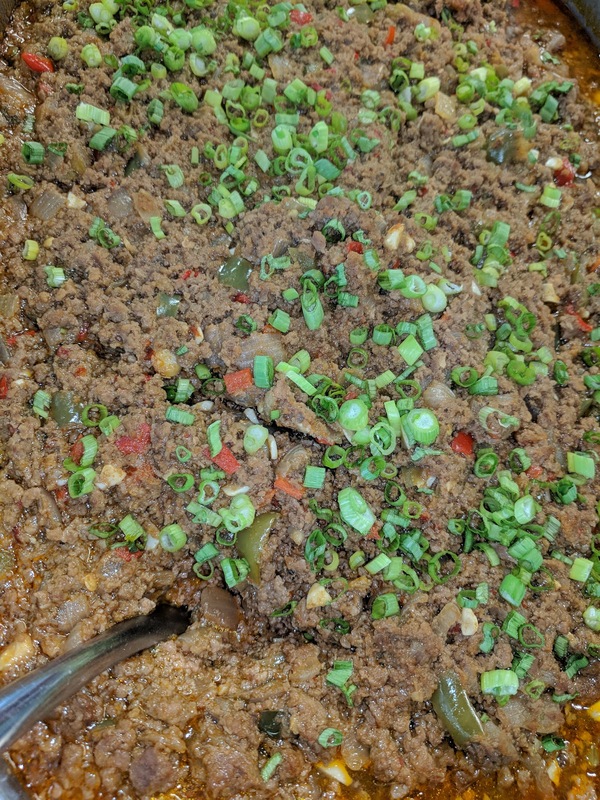 Leftover Sloppy Joe Filling Transformation. 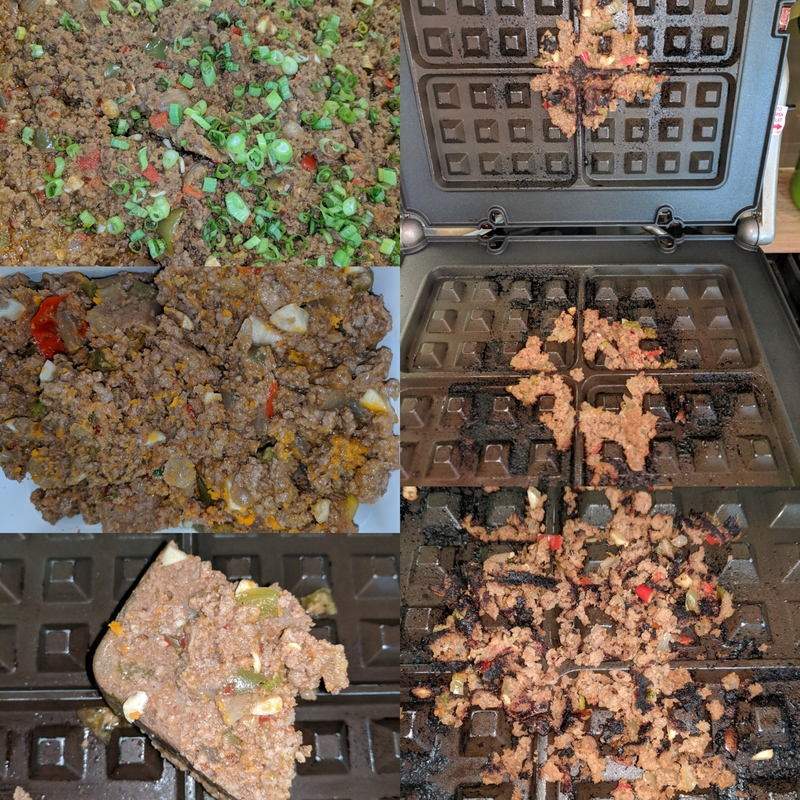 Will it Waffle: Leftover Sloppy Joe Filling? Uh, no. I'm not sure why I thought this would work exactly. It was salvageable, but certainly not one for the success column. 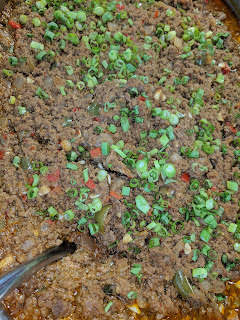 The Original: Sloppy Joe Filling. 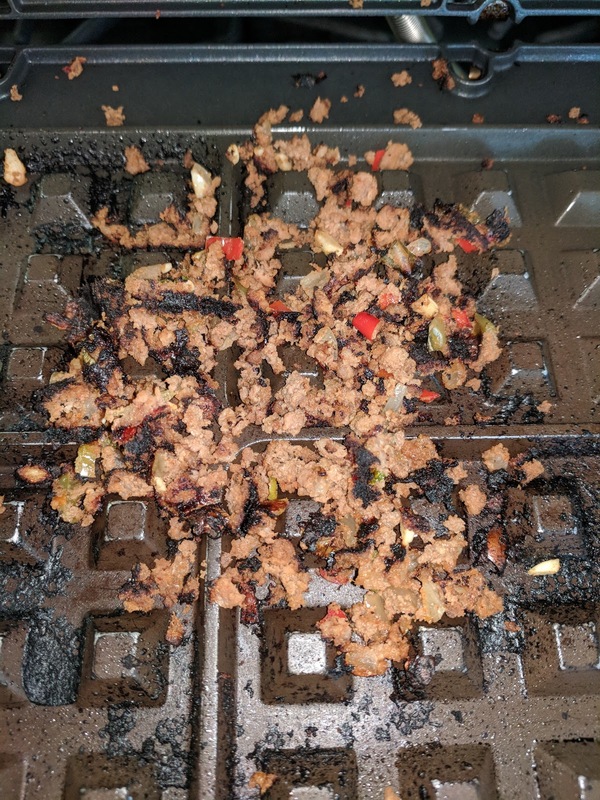 The original was the filling for sloppy joes. It wasn't as tomato-y or sauce-y as most sloppy joe I've had, but it was still quite tasty. 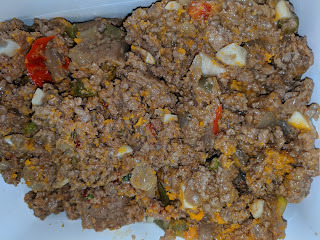 Ground beef base, chopped green and red bell peppers/onion/garlic, ketchup/brown sugar/cider vinegar, and seasoned with thyme/cumin/paprika. Very good. But we had too much leftover. 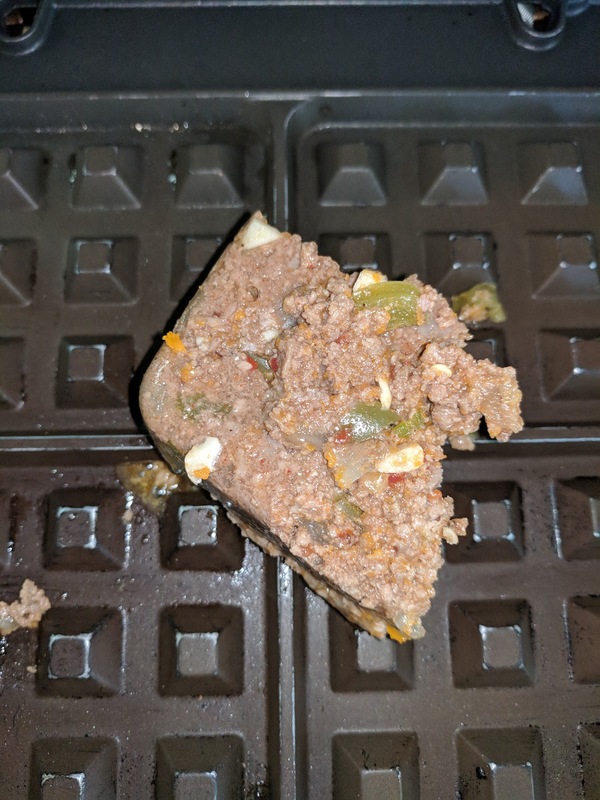 The first day, I reheated some in the toaster oven, and served it traditionally on a bun. It was fine, no quality degradation. I had some cold the next day, but that wasn't great. I was sick of sloppy joes though, so I wanted to have some fun with the remainder. 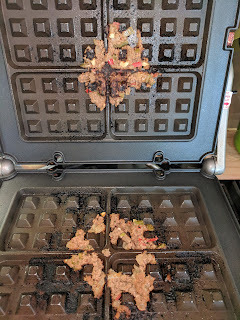 So I took a big solid clump, held together by the congealed solid fats, and put it into the waffle iron. No crusting, no additions. In my head, I thought it would cook kinda like a burger patty? Let's just say, things didn't go as expected. Partially because I was doing housework while it was cooking, and I left it going far longer than I intended. I opened the lid to find a bit of a mess. Because it had no crusting, there was no reason to have any structural integrity, something I kinda forgot about in my glee to waffle anything and everything. Of course it didn't hold together. It was also totally dried out. The best part of the sloppy joes is the sauce and how it soaks into the bun, and this was just a bunch of dry, seasoned ground beef. Extracting it was impossible. I started picking at it with chopsticks, eating a few bites directly off the iron. It didn't taste ... bad exactly. Yes it was dry, but it was very flavorful still. The seasoning was still there. And now it had crispy bits. Totally not what I was aiming for, but, well, it kinda worked. I commented to my dining companion that it reminded me a bit of Persian food, and that I thought it would be good over rice with yogurt. He tried a bite, and admitted that it wasn't bad. He was about to dig into a plate of indian food (saag paneer and rice), and offered to take it and have it over the rice. I gladly gave it to him, happy to see it salvaged. It is no secret that I love Sydney. If it was not on the other side of the world, I'd move there in a heartbeat. I love so many things about it. The weather (summer!). The atmosphere and culture the mild climate create, with indoor/outdoor living and dining the norm. The people (so laid back!). The lifestyle (everyone is active!). And of course, the food. In particular, the incredible asian influence, and ingredients, that we just don't get in the US. Oh, and the cafes. Sydney takes its cafes, and brekky, very seriously. Bill's, the Sydney classic, which introduced me to the most epically good ricotta hotcakes, and then broke my heart in subsequent years. Trio in Bondi and Bread and Circus Wholefood Canteen, both pretty mediocre, but Trio has nice beachfront locale. Creative brunch fare at Devon Cafe. 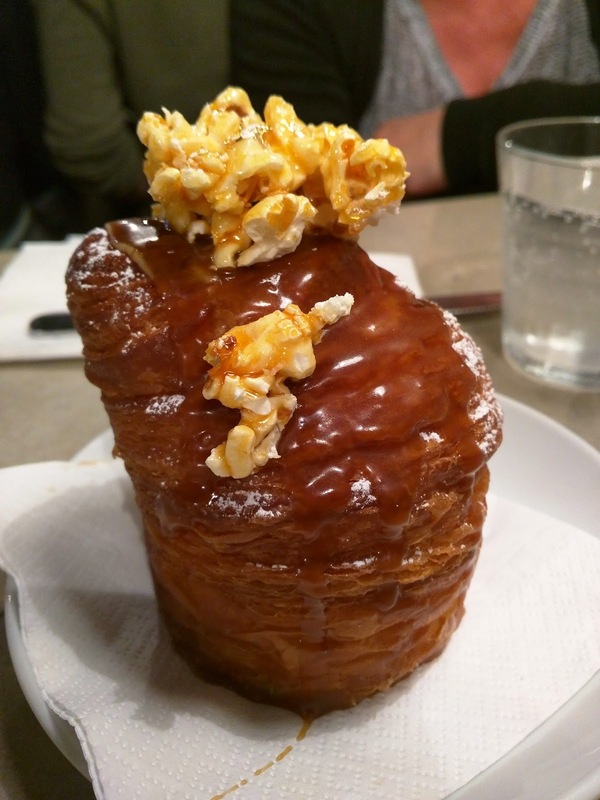 Salted Caramel with Popcorn Cruffin. Fujipan with fun Japanese baked goods [ Sadly now closed ]. Uncle Tetsu Japanese style cheesecake, cheesetarts, and more. And lines. Long lines. Hybrids like cronuts have hit Sydney too, at Bécasse, and cruffins at Brewtown Newtown. The best breads I've ever had from Dough Collective [ Sadly now closed ]. The famous panna cotta lamington, from Flour & Stone bakery, really great ... for a lamington, but still a lamington. Epic pies (both sweet and savory), from Pie Tin. Decent cookies from Madhouse Bakehouse. Donuts and good coffee from Workshop Espresso. Breadtop, not nearly as good as 85* Bakery Cafe. 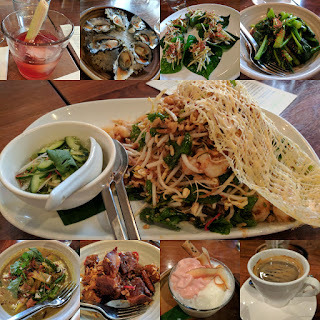 Thai Banquet Feast @ Longrain. 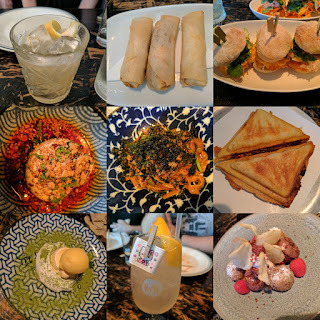 Sydney institutions: Chat Thai (and spin-offs Boon Cafe and Samosorn Thai) and Home Thai. Muum Maam for more Thai family style group dining. My favorite Sailor's Thai Canteen and the more formal Restaurant (both sadly closed). A nightly ritual, getting dessert from the "Thai Hawker", or, Thanon Khaosan. 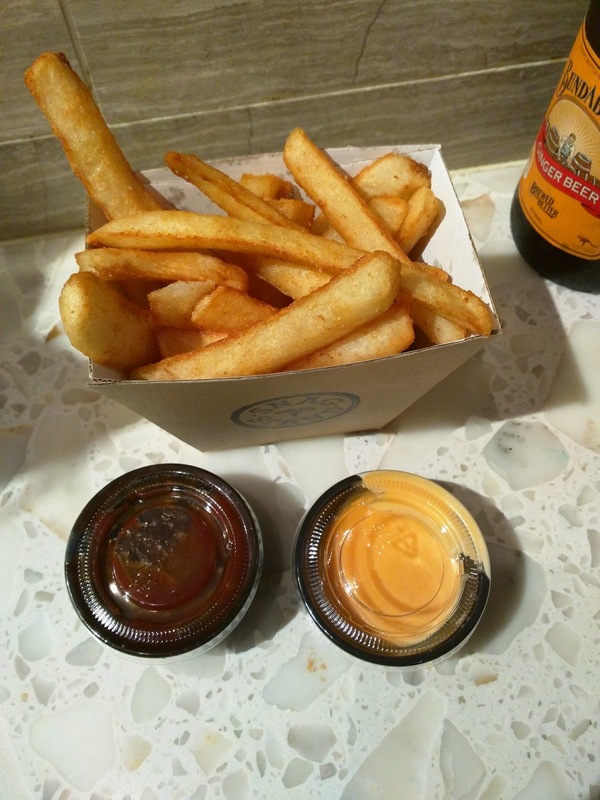 Fantastic Fries & Dips @ Snag Stand. Mamak for Malaysian roti, fried chicken, and noodles. ZOMG, the dessert Roti Bam! Chinatown Noodle Restaurant for great dumplings, and a lot of, uh, ambiance. Not impressed by the worldwide dumpling sensation Din Tai Fung, not for savory, sweet, nor even premium black truffle dumplings. I visited 3 different locations (mall food court, World's Square, and Central Park). Martabak Cafe ... for martabak. Did not like! Beachfront dining at Watson's Bay Beach Club ... just don't really go for the food. The Fish Butchery: really fascinating place, wonderful to explore seafood variety, but I think I ordered poorly. 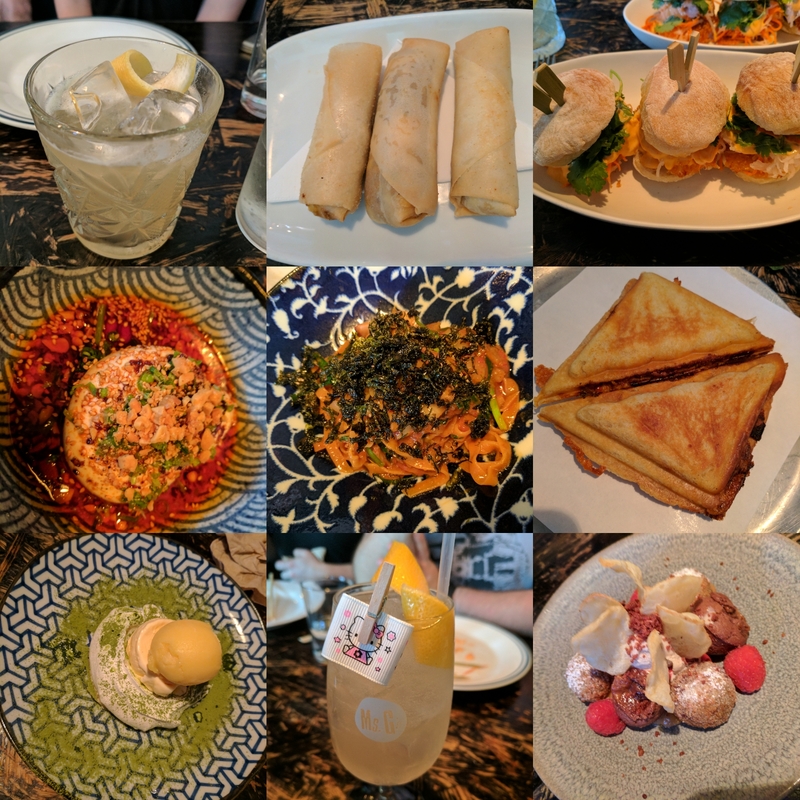 Asian Fusion Gone Right: Ms. G's. Very good modern Chinese, Mr. Wong. And not so memorable modern Asian at China Lane. 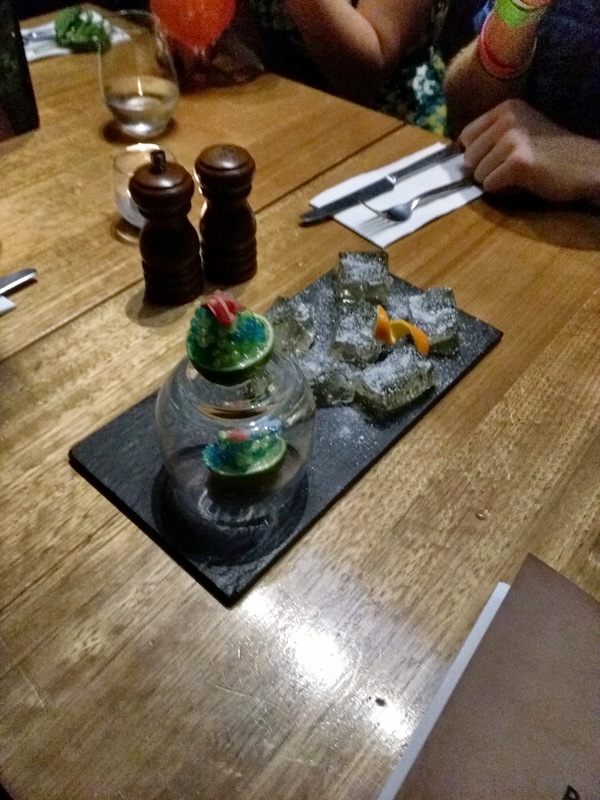 Modern Australian, unique ingredients, rustic and comfortable setting, at The Govenor's Table. Mediocre dim sum at China Doll and Luya and Yum Yum. Fancy Bar Dining at Rockpool Bar & Grill. Very overpriced mediocre sushi at Sokyo. Lumi for innovative cuisine (think: savory churros). Quality fine dining at Bentley. Margarita Caviar? Gin & Tonic Jellies? Yup, at Rabbit Hole. Red Lily for excellent Vietnamese and drinks. Memorable crispy mac and cheese balls at Pocket Bar . 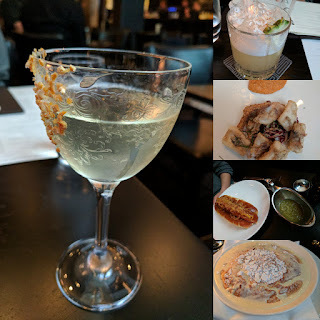 Molecular gastronomy drinks at a bar? Yup, at Rabbit Hole. Rose Soft Serve with Popping Candy @ Aqua S.
Good Times Artisan Ice Cream for ridiculous soft serve gelato sundae creations that are Instagram worthy, but very difficult to eat. Decent black sesame soft serve from a mall food court, Rice Workshop. 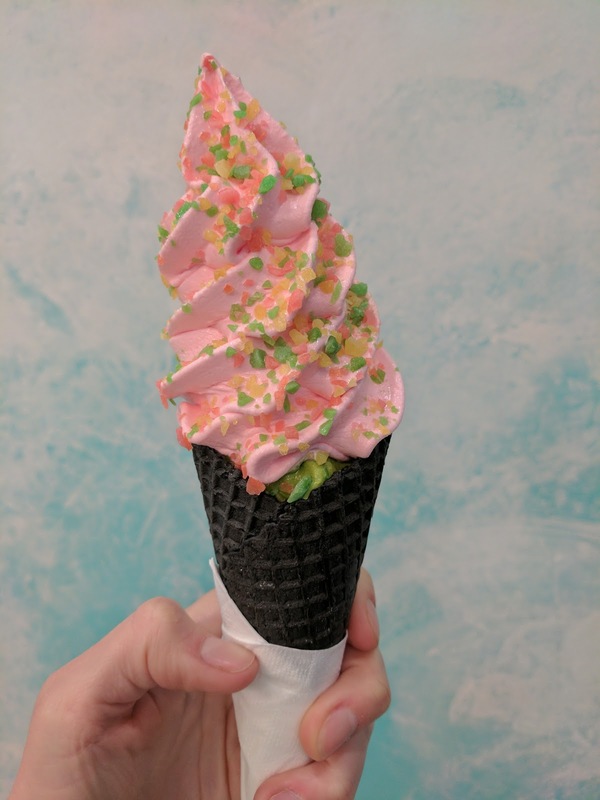 Classic Streets ice cream treats. Very good taro bubble tea ice cream sundae at Devon Cafe, North Sydney. Crazy asian creations from Chanoma cafe. 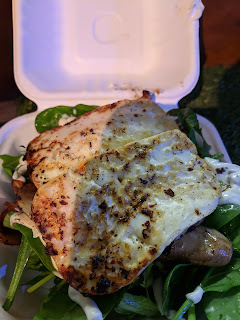 The Haloumi Burger (Salad option) from Vejoes Vegetarian Food Truck. Vejoes, for incredible vegetarian food! Oh the halloumi! Tasty flavored milks, from OAK and not as tasty, from Nippy. Actually tasty bars from Be Natural and breakfast bars from SuniBrite. Breakfast on the Balcony @ Sheraton on the Park. Standard chain milk tea at Chatime, and, my discovery of the joy of cheese foam. Milk tea, that comes with a canvas reusable carrier sling? Great advertising at CoCo Fresh Tea & Juice. One of the older, non chain, shops, Original Royaltea, not bad, and interesting add-ins too. I've been to Sydney many times. I've flown several airlines, some direct, some through LAX, some through Auckland, several different classes of service, and many aircraft types. They all offer different trade-offs, but I think Air New Zealand is my top pick for flying experience, but Qantas wins no question on the lounges. 2015: NZ7, International Business, great night's sleep and shockingly good burger. Works Deluxe (not nice seats, but, wow, I liked the lunch). 2015, 2017, and multiple times in 2018, always in International Business, the later flights far more successful than the first (halloumi! Panna cotta! Ice cream! Yes!). Auckland International Lounge (and previous lounge). New business lounge in Sydney, with excellent breakfast. Lackluster flight, upper deck, LAX-SYD. Upper deck of the 747, SYD-LAX, actually some really tasty food. Direct route, SYD-SFO, again on the upper deck of a 747. Simple domestic business class, SYD-MEL. Dreamliner service, but still Qantas standards, MEL-SFO. Decent, brand new First Class and Business lounges in LAX. First Class and Business Class Lounges, Melbourne. Go for the massage, the buttered popcorn, and the brownies. Seriously. LAX-SYD, better seats, better food that Qantas. LAX-SYD, nice bed, cool bar space, lackluster food. Star Alliance Lounge, TBIT, LAX: Amazing rooftop terrace, well seasoned food, good cheeses. Remarkable onion rings from Bar Roma, Sydney Domestic Terminal. Wok on Air, Sydney Domestic Terminal. Don't go for the sushi, but load up on the prawn and lotus chips! Interesting muffins from Mach 2. Good coffee, and mediocre muffins, from Peroni Bar. Better Burger: no recommended, awful soft serve ice cream. Cafe Vue, Melbourne Airport. Not the best, but a couple decent baked goods. 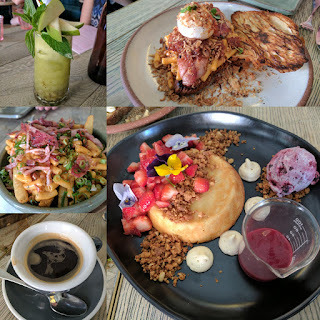 Bar Pulpo by Movida, Melbourne, not the best destination for muffins.